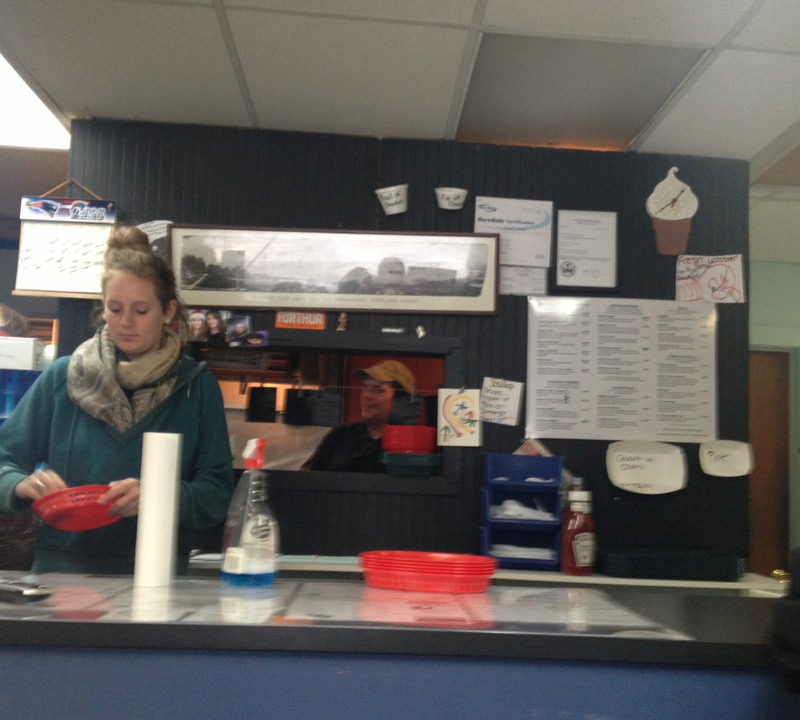 Earlier this summer we dusted off the road bikes and headed toward Revere Beach to visit an institution: Kelly’s Roast Beef. 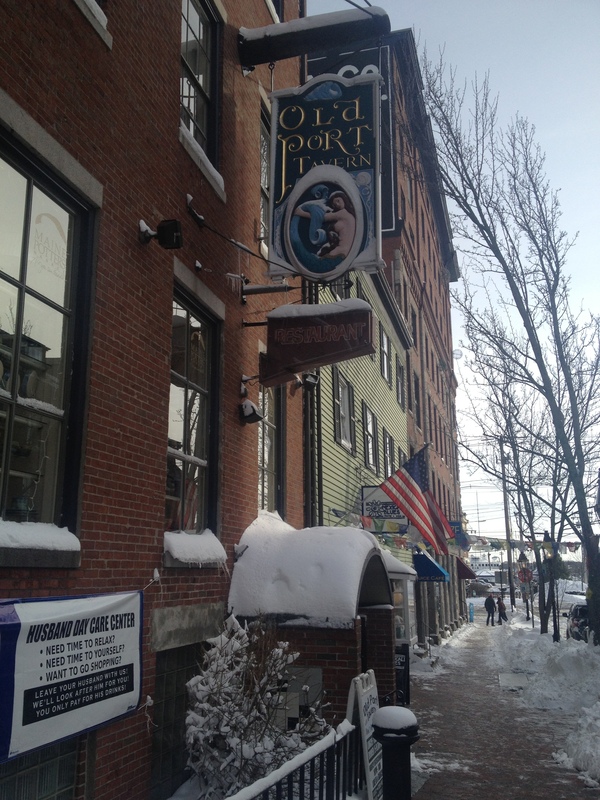 Nowadays known to most simply as “Kelly’s,” it seems nearly everyone north of Boston has been to Kelly’s, and opinions vary – some people swear by Kelly’s, where others despise the place. We think this is because Kelly’s has been around so long that it has become a sort of caricature of itself – that is, people more often express opinions about the “idea” of Kelly’s, than they do about their actual experiences there. We certainly felt this was true of ourselves, and we wanted to give Kelly’s a fair shake. One thing’s for sure, Kelly’s always seems to be busy. 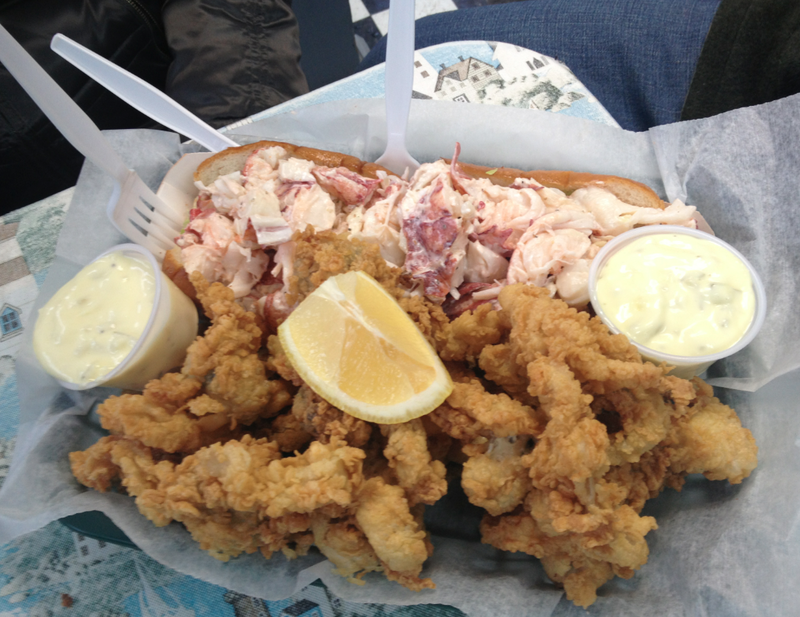 We waited a bit before placing our order, and in 10 minutes we picked up our rolls and headed across Revere Beach Boulevard to the picnic tables overlooking the beach. Our initial impression was very favorable. This roll was loaded, and enclosed in a beautifully butter-grilled split-top hot dog roll. 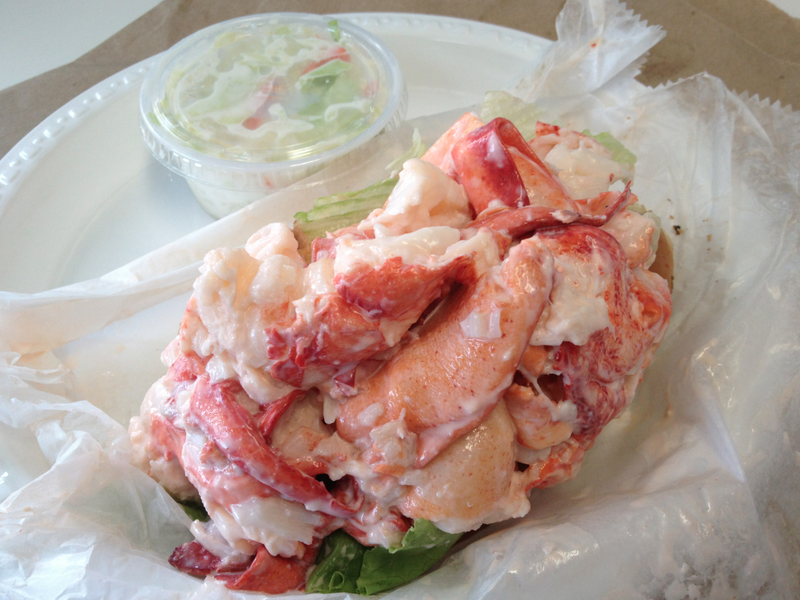 The lobster meat was very fresh, dressed with mayo and a tiny bit of diced celery (i.e. not so much as to count against them). The portion was large and, if the review was to end here, Kelly’s would have ranked very highly indeed. Now, the rest of the story. We had two complaints about the Kelly’s roll. First, this roll was way over-salted – so much so, that it was difficult to imagine eating the accompanying potato chips after polishing off our rolls. 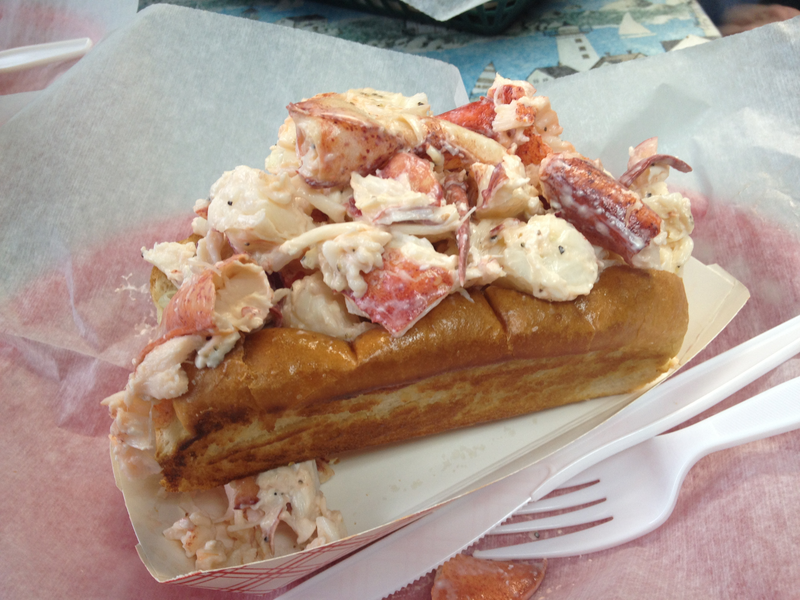 Second, and this observation was confirmed after the fact by several other lobster roll hounds we know, this roll was, in a word, soggy. We’re not saying the bread was soggy – it wasn’t. What we’re saying is that the lobster meat itself was just way too wet, not from too much mayo but from what we assume to be excess water left over from the picking process. You can see from our accompanying photo, the mayo on this roll looks watered down, because it was… and that’s exactly how it tasted. 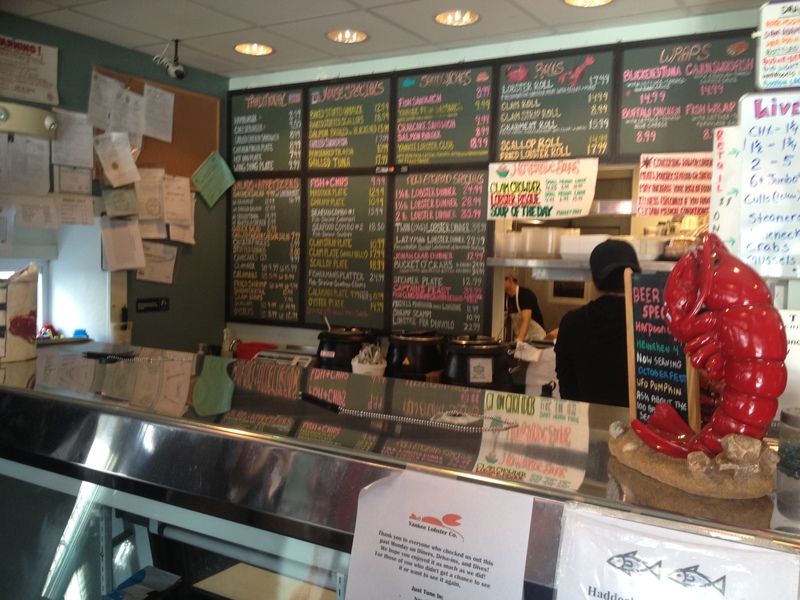 Kelly’s has multiple locations, but we visited their original location at 410 Revere Beach Blvd in Revere, MA. WEBSITE: http://www.kellysroastbeef.com/wordpress/. FACEBOOK: https://www.facebook.com/KellysRoastBeefInc?ref=s. PHONE: 781.284.9129. 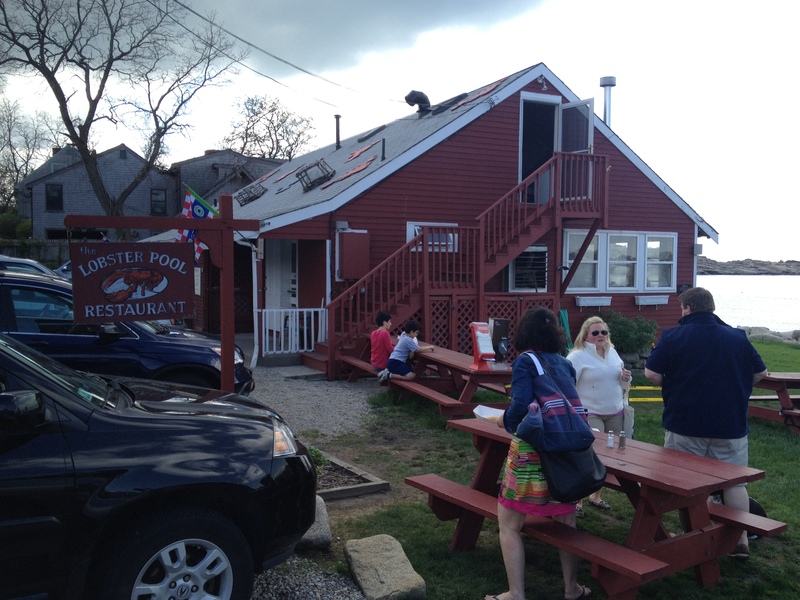 Anyone who’s visited Cape Ann has likely driven by The Lobster Pool in Rockport, MA. Traveling counter-clockwise around the island, the Pool is just past Halibut Point, at the bottom of the big hill, on the right after the bend. 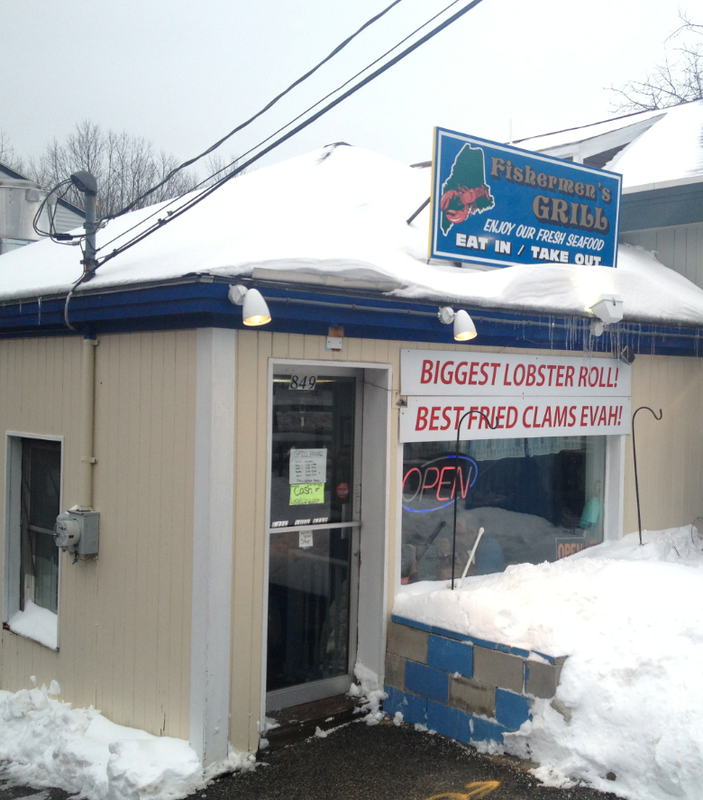 This shack is always jammed, and we’ve heard loyalists claim it was the best roll around. So, we figured why not choose The Lobster Pool to kick off our 2013 Season. 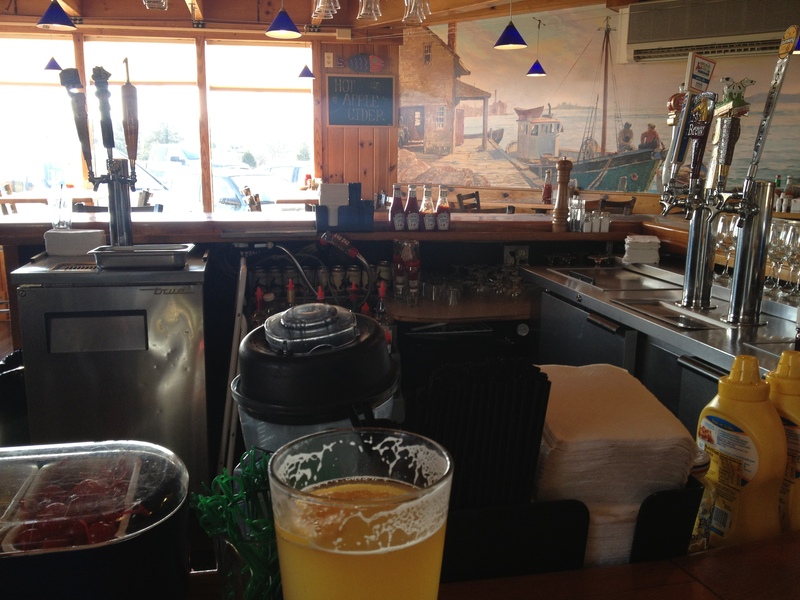 This place is right on the ocean, with clear views of Coffin Beach, Crane Beaches, and Plum Island beyond. Lots of picnic tables and a lawn leading down to the water provide a very nice setting (although the lawn was off limits during our visit – re-seeding, we assumed). A sign on a dinghy-turned-planter announced nightly campfires and s’mores — a nice touch. 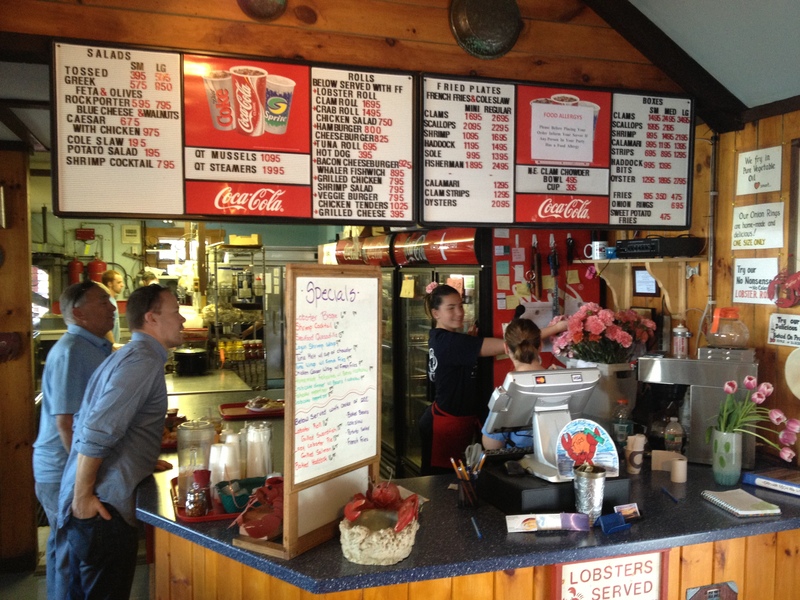 Inside, this is an authentic shack with an eat-in-the-rough feel and lots of lobster paraphernalia, including a live lobster tank and a swag section where you can buy Lobster Pool sweatpants if you should have a sudden urge to look like a tourist. 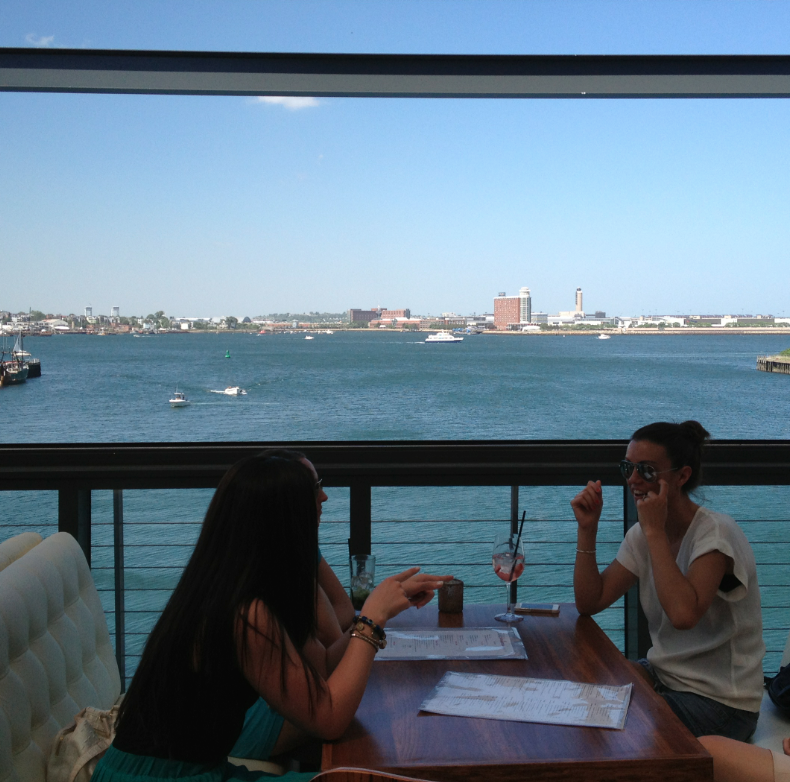 The dining room features large windows so less-hearty souls can enjoy a splendid view of the Atlantic. We ordered two rolls and sat tight as they were made to order. When the counter girl called our number, we took our tray outside and grabbed a seat at a picnic table. The place was bustling, and we were lucky to get a seat. Proximity of the seating area to the car park was the only downside… that is, until we tried these rolls. 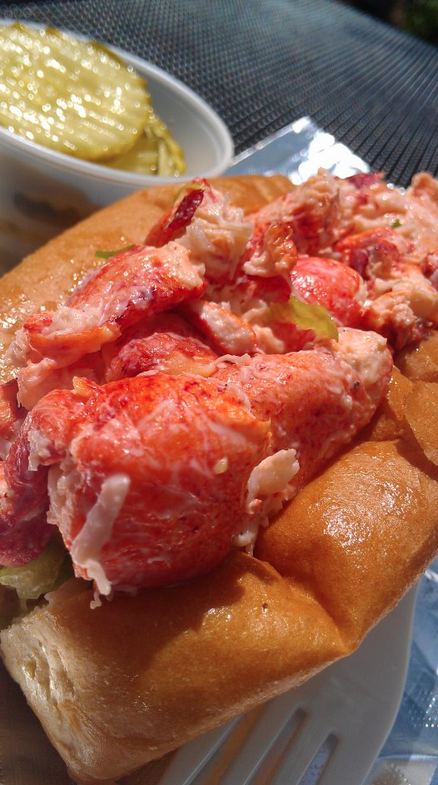 These lobster rolls were small. Although we typically don’t talk much about price (unless something is out of whack), and in this case $17 for a small split-top hotdog roll unworthy of a Fenway Frank was a poor start to the experience. The lobster meat was good, but there was absolutely nothing special about it. It was lightly dressed in what well could have been low-fat may (we’re not saying that’s with they use, only that that’s what it tasted like). And, the role itself was apparently toasted dry, not grilled, and without even a hint of butter. A few random shreds of lettuce lined the bottom of the roll, solidifying the absolute mediocrity of the experience. 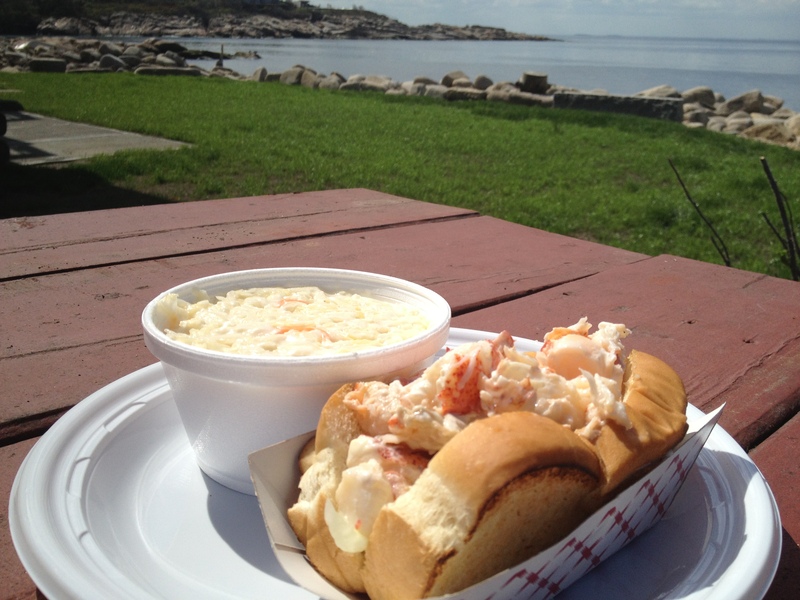 The Lobster Pool can be found 325 Granite Street in Rockport, MA. 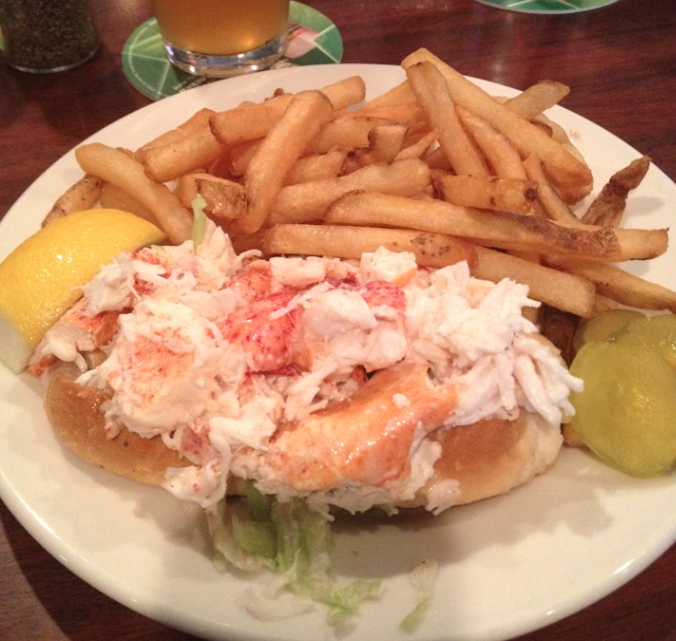 WEBSITE: http://www.lobsterpoolrestaurant.com/main/index.php. PHONE: 978.546.7808. Check their schedule, as they are a seasonal business. 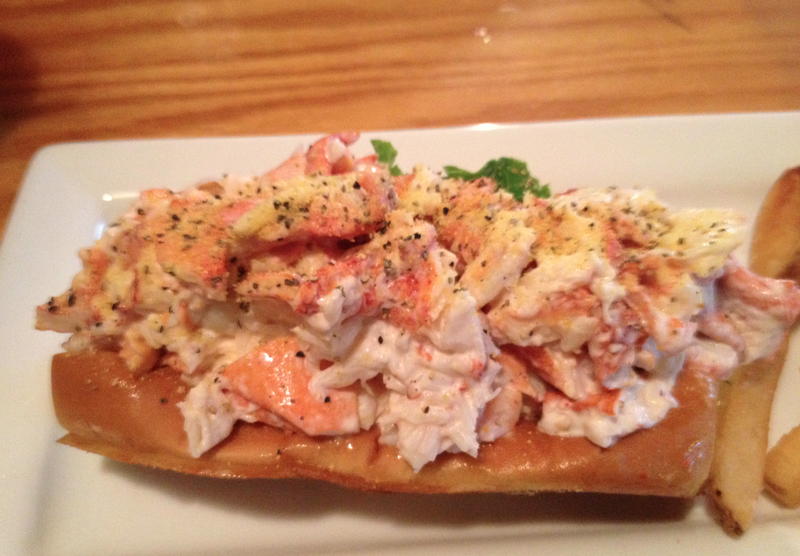 The lobster wasn’t bad, but this roll was small, unmemorable, and over-priced. 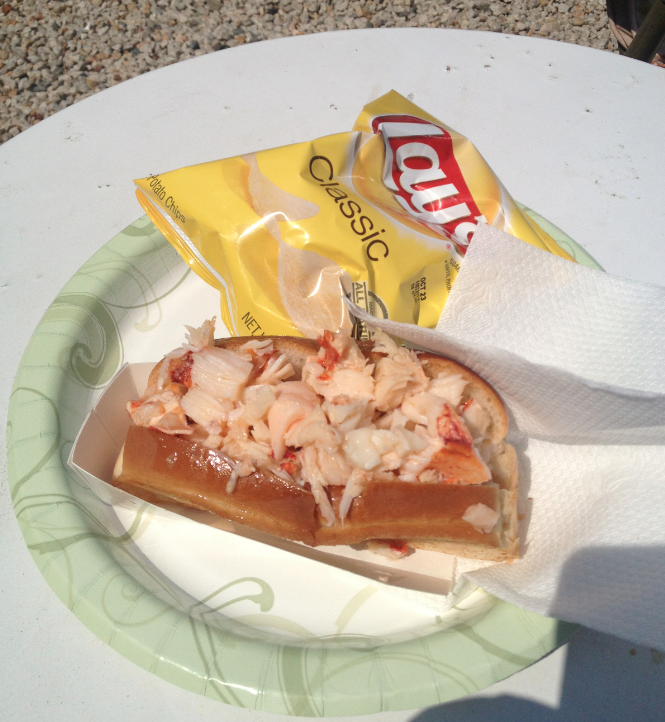 We’d been to Latitude 43 on several occasion, so when cruising Cape Ann this past weekend we decided to stop in and give their lobster roll a try. 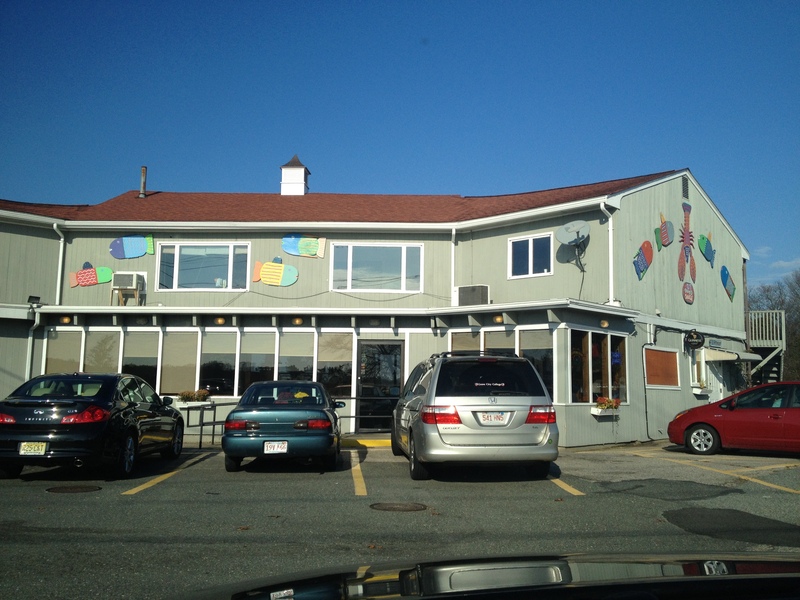 If you haven’t been, Lat43 is harbor side in Gloucester, overlooking fishing boats and the landmark Cape Pond Ice Company. 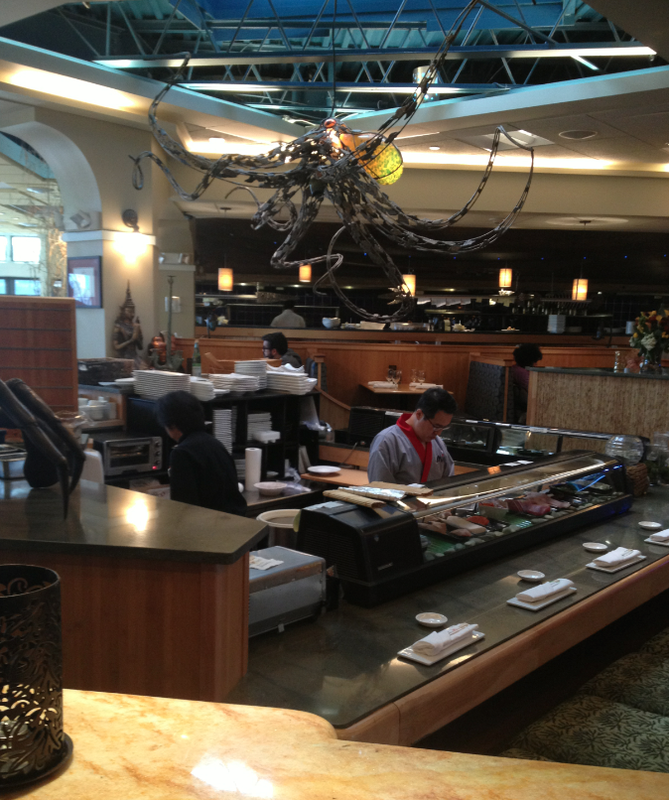 The restaurant is pretty eclectic, with a fusiony menu and a sunken sushi bar. 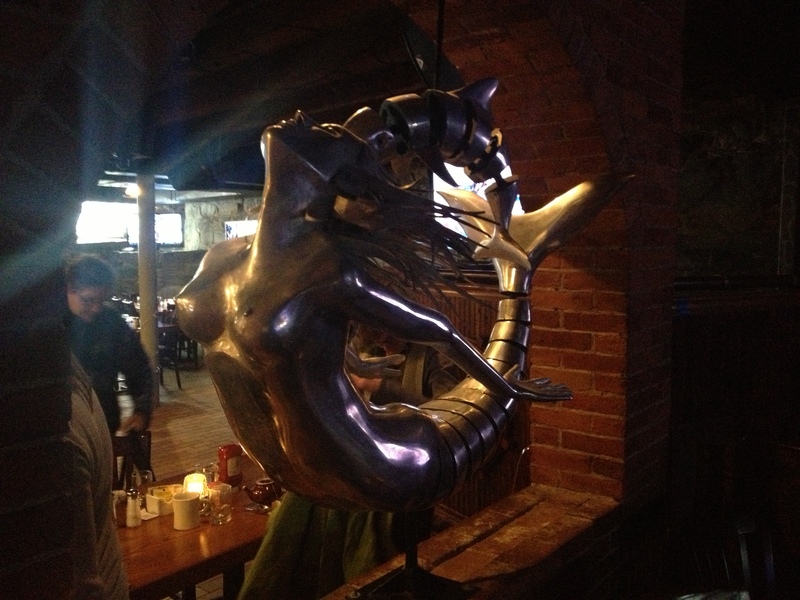 Cool artwork and a tropical fish tank make Lat43 feel quite different than most Cape Ann haunts. 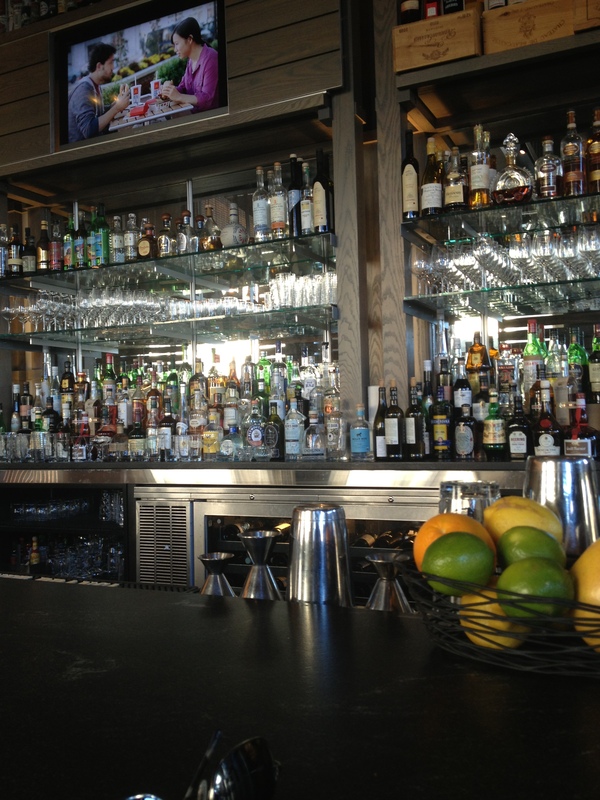 In the summer their outdoor seating is right on the water, and they also have live music in their pub area. 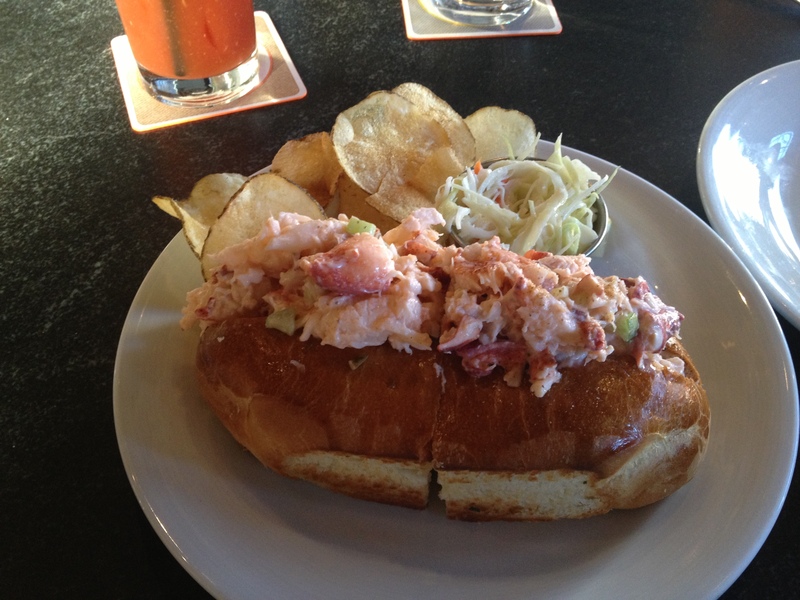 As is most often the case during the cold months, we planted ourselves at the bar and inquired about the lobster roll. “They’re good,” our server Will said, and we ordered one roll each. 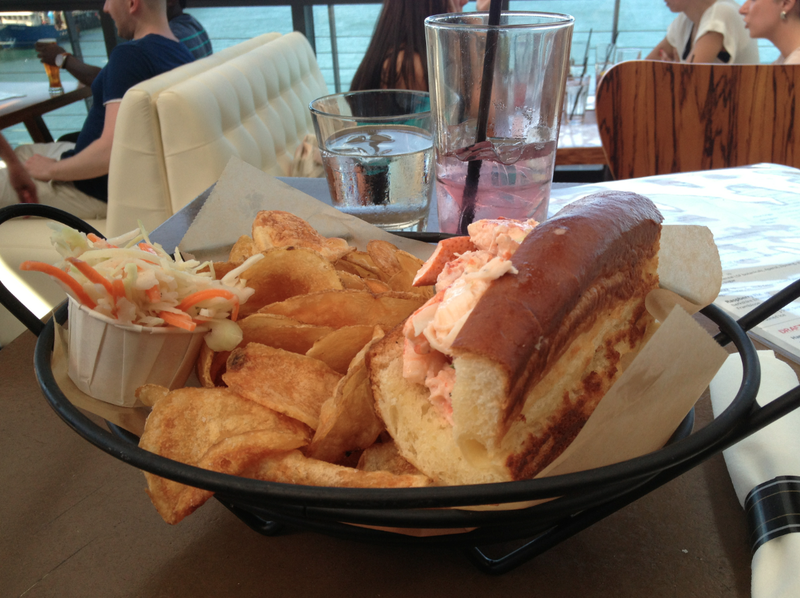 After a relatively short wait, the rolls were delivered on planks with sides of apple coleslaw and some crispy fries. The lobster meat was very fresh and the portion was a good size… but Houston, we have a problem. 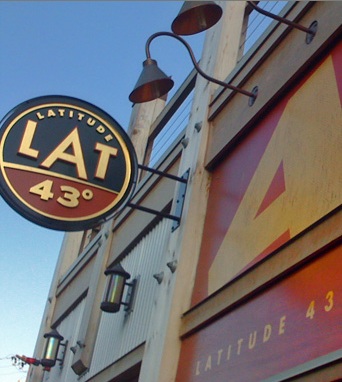 Aside from the tabooed use of celery (admittedly chopped very small), Lat43 also uses green onion in their roll. This might not have been a problem, except that they used so much that the delicate lobster meat was completely overpowered by onion. Another problem was the bread itself, which was very large – much bigger than the typical New England-style split-top hotdog roll. 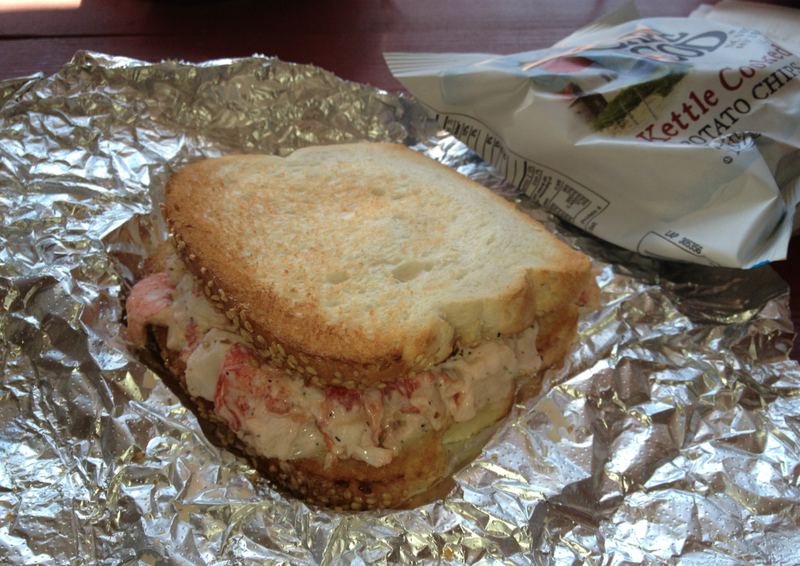 In fact, it was so disproportionately large that large mouthfuls of bread tended to mask the taste of the lobster (but, unfortunately, not the onion). 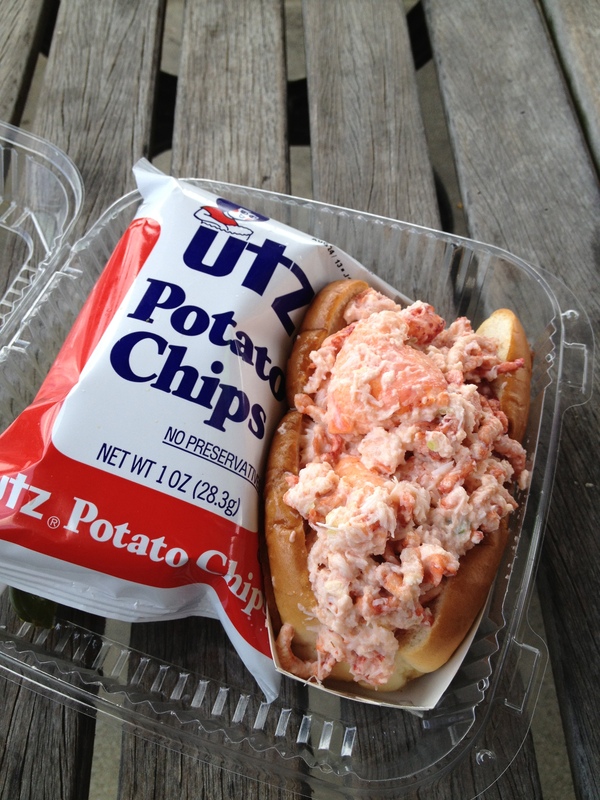 This brings up an important point about The Lobster Roll Chronicles’ methodology. Some roll reviewers will modify their rolls, adding or removing ingredients, or dipping them in butter. We do not do this. Instead, we review the roll as-delivered, just as we received it. We don’t add anything that wasn’t provided along with the roll, and we don’t dissect our rolls to minimize bad ingredients. So, although we may well have improved this roll by removing excess bread, that’s just not what we do. With all this said, Lat43’s roll wasn’t bad. But a better roll and less green onion (and elimination of celery) would definitely raise their score by several points. Not a bad roll, but some slight tweaks could make it a lot better! 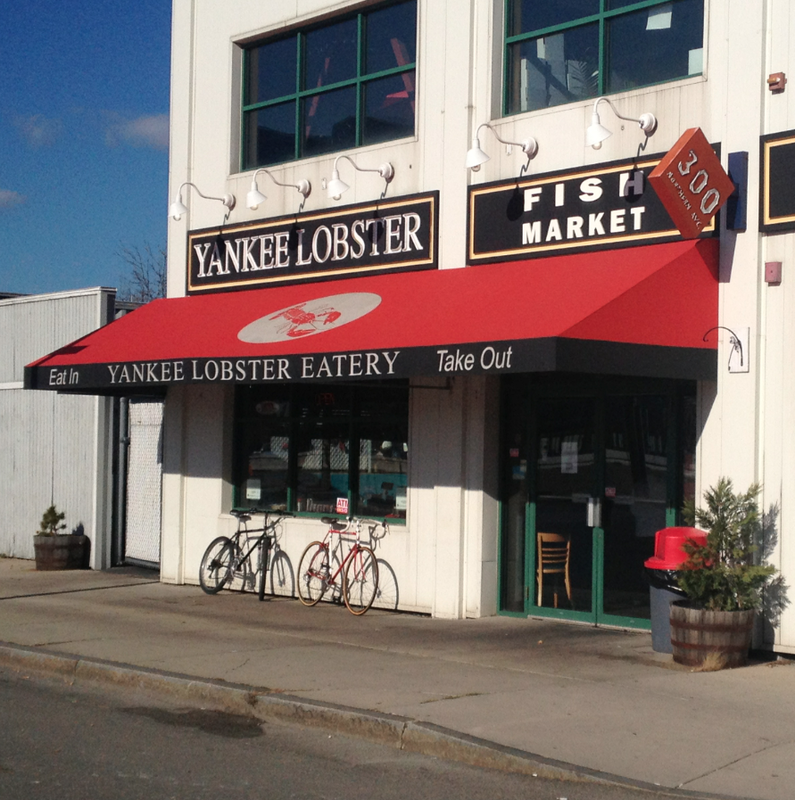 Yankee Lobster Company is located in the Seaport District, right next to the Bank Of America Pavillion. 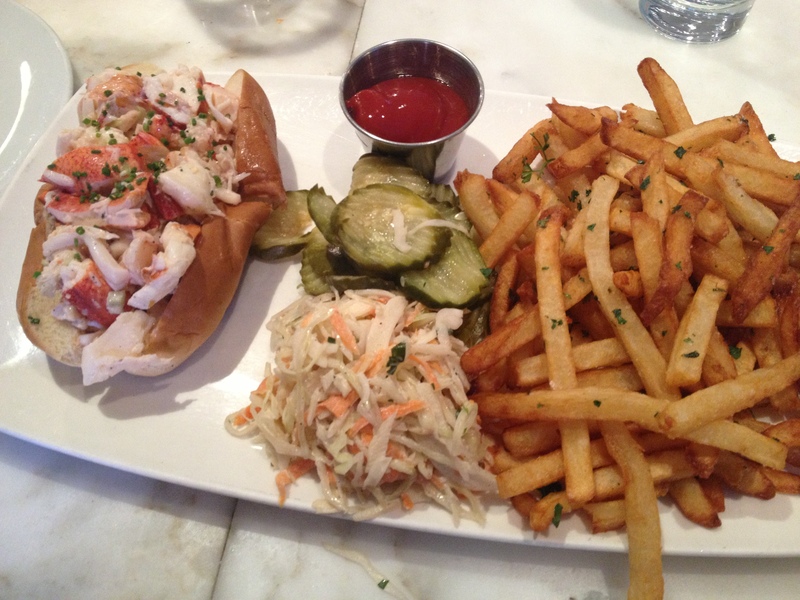 A staple of the South Boston waterfront since the 1950s, Yankee Lobster regularly appears on various best lobster roll lists. We had never been, and had been looking forward to our visit for some time. We arrived at noon on a Sunday, and were surprised to see the place hopping. This felt strange, as the surrounding area is primarily commercial, and on a Sunday this part of town really does feel like a ghost town. But, here we were, happily waiting in line, having been lucky enough to snag the last remaining open table. We waited about ten minutes for our made-to-order roll, while admiring all the history hanging on the walls. Generally, the place felt pretty good. We noticed there was a 50-50 mix of tourists and locals. This roll is not large. The roll itself is a standard split-top hotdog roll which was toasted but devoid of any buttery taste. The lobster meat tasted fresh, but was actually quite dry. 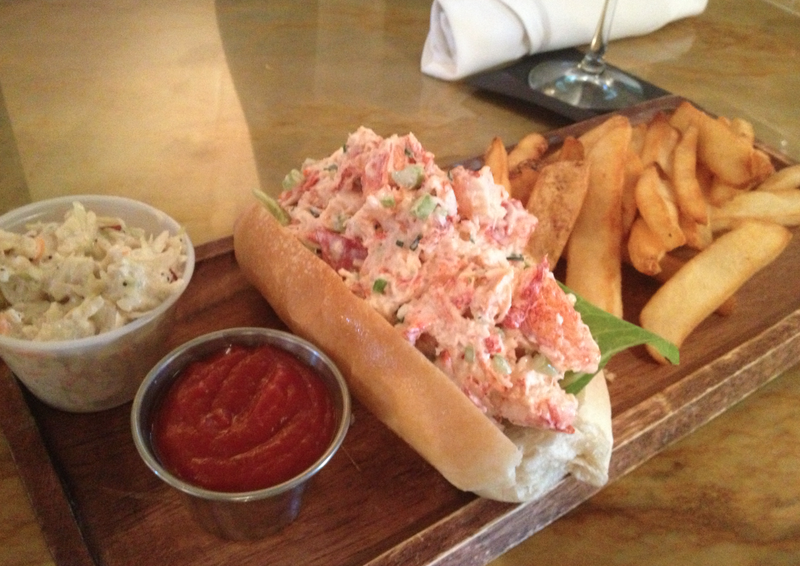 It’s unusual to hear us say so, but this roll could have definitely benefited by a bit more mayo. And, although we are pretty firmly entrenched in the anti-celery camp, the celery that came in this role was diced so small, it really didn’t distract from the overall experience. What did distract from the experience, though, was an nearly complete absence of taste. This roll completely lacked a buttery bottom. There was no zip or tang typically provided by mayo (or, God forbid, Miracle Whip). We weren’t even provided with the gratuitous lemon wedge. We will say that Yankee’s coleslaw and crispy fries were actually pretty good. If only the roll itself could have held up its end of the bargain. 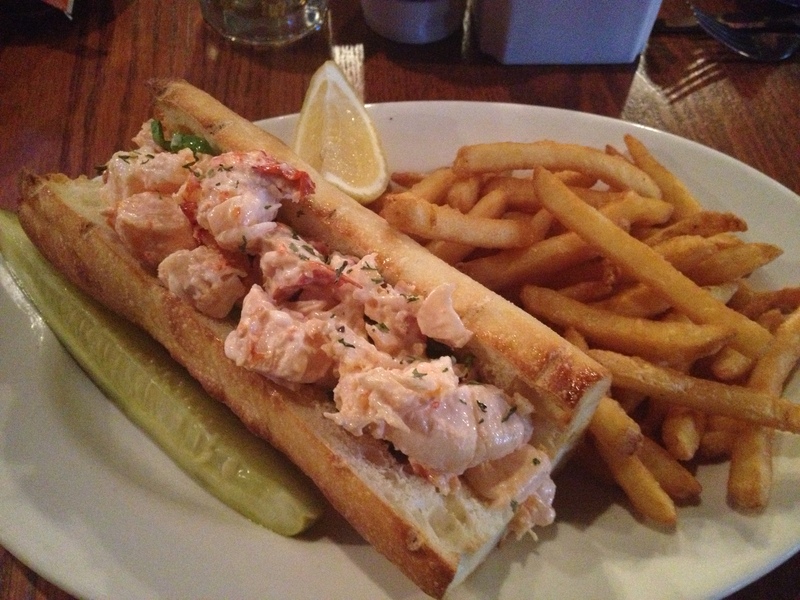 Yankee Lobster’s roll. Surprisingly tasteless. 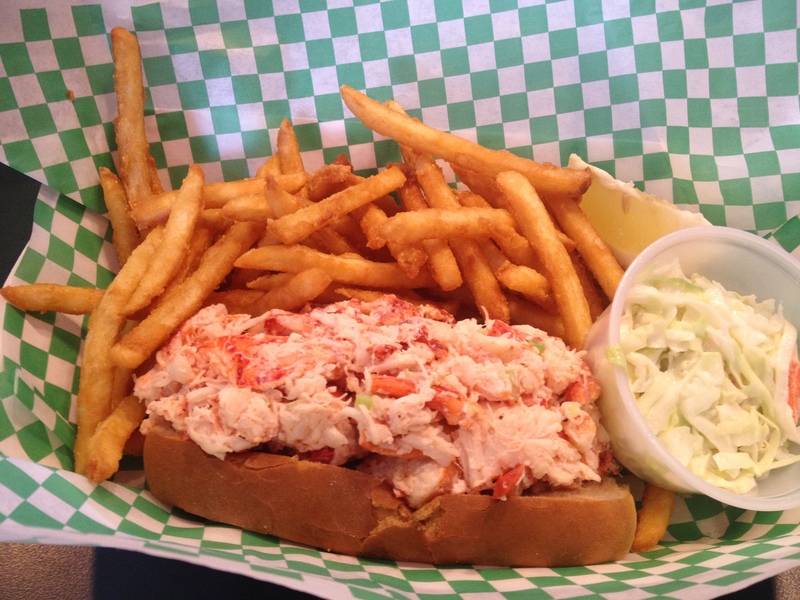 Lobsta Land is located off of Route 128, just before the big bridge over the Annisquam River. 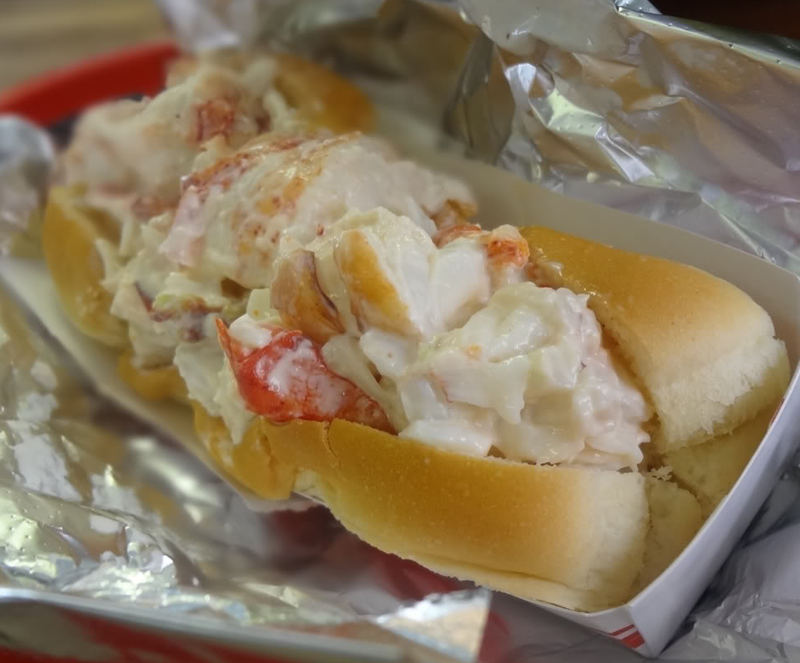 As such, although they’re technically in Gloucester, Lobsta Land is definitely “off-island.” We wondered if this might lead to some bias amongst Cape Ann “on-island” purists. 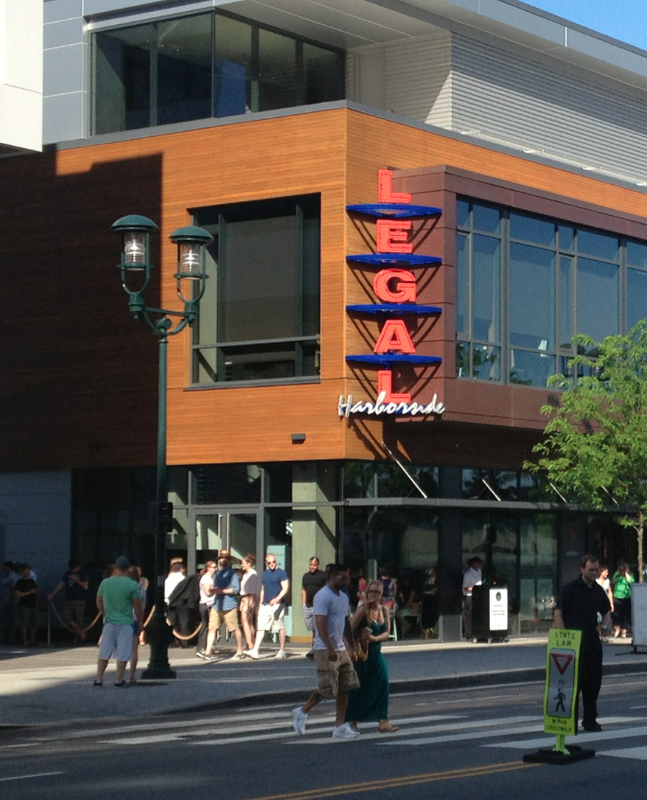 Yet, it’s a definite destination for locals and has been in business for years and years. 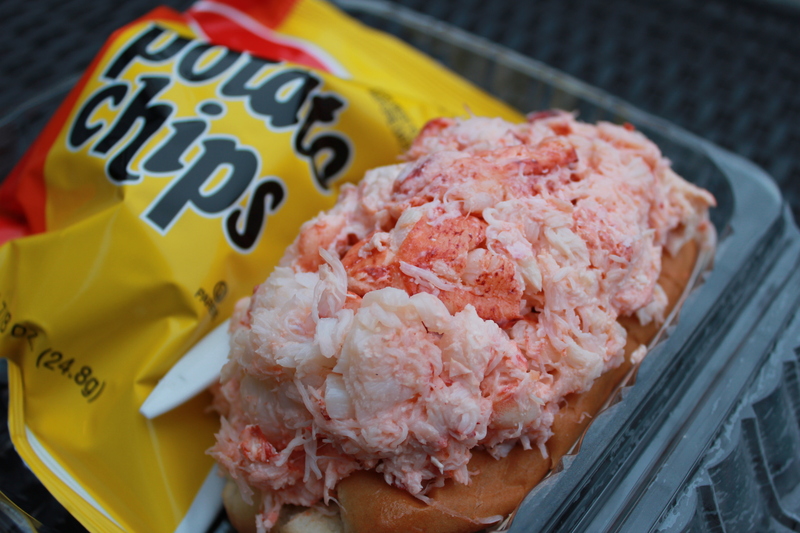 Neither of us had even been to Lobsta Land until we dropped in a few years ago on the very strong recommendation of a friend. At that time, we were really disappointed by some pretty poor customer service. If not for The Chronicles we’d probably never have gone back, but there exists a very loyal contingent of Lob Landers who’s conviction and enthusiasm convinced us to give them another try. We dropped in after a long hike and were quite hungry. And, since it was a football Sunday, we opted to seat ourselves in the lounge. Quite surprisingly, the place was completely empty. Lobsta Land gets a pass, though, as it was the first really nice day in a long time so people were likely taking in the sunshine. Our server, Zoe (who actually runs a very cool vegan baking blog you can visit here), told us it was very unusual to be so slow. 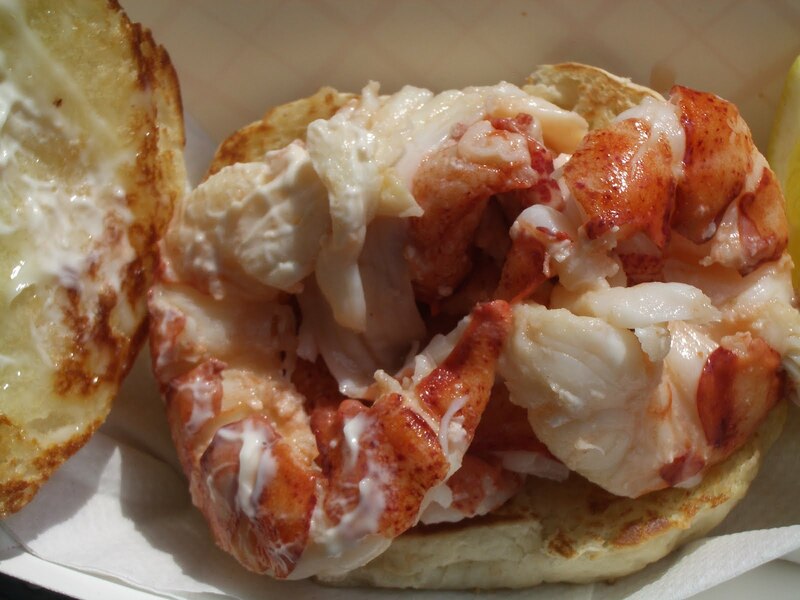 We asked “How are the lobster rolls,” and she cheerfully shared that Lobsta Land won Best Lobster Roll North Of Boston 2012 by Boston Magazine. Well that was good to hear but the proof is in the pudding. We each ordered a roll and were pleased with the turn around time. These rolls came in a beautifully butter-grilled brioche roll with no lettuce or any other nonsense. Just to emphasize, the roll DEFINITELY makes a difference! The lobster meat itself was very fresh and was lightly dressed with just a bit of mayo. One thing we noticed was that these rolls seemed to be made mostly of claw meat. 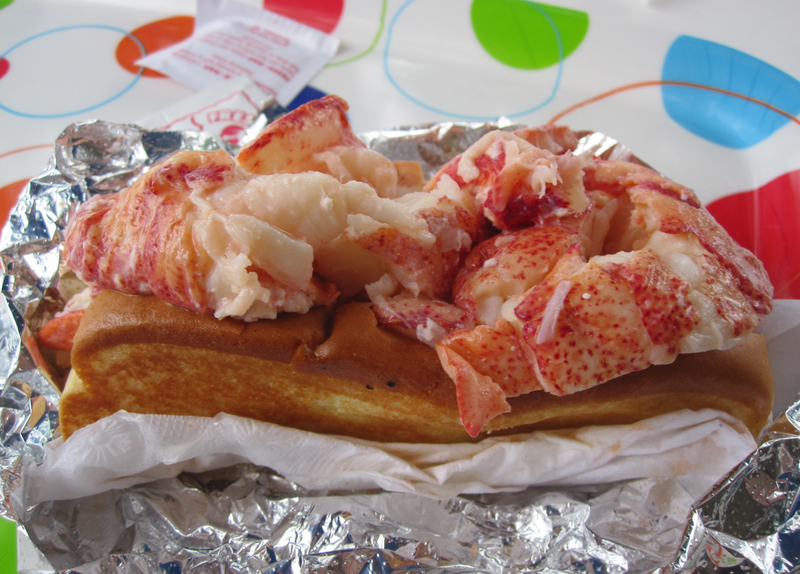 We love lobster tail, but in this case the mostly-claw construct was in no way a negative. Based on previous experience, we expected to be disappointed in these rolls. We weren’t. They were delicate, fresh, perfectly dressed, and featured the requisite bottom of a really nice roll that was butter grilled and had a great foundation. All in all, this was a really great roll. The fact that it was accompanied by a large order of crispy fries and home-made coleslaw (an great, friendly service) was a bonus. 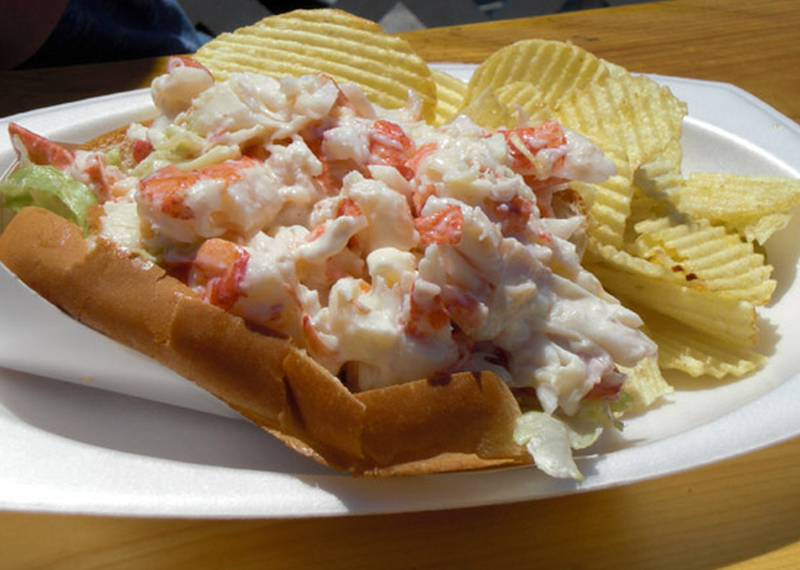 Lobsta Land is located at Exit 12 off of Route 128, 84 Causeway Street in Gloucester, MA. 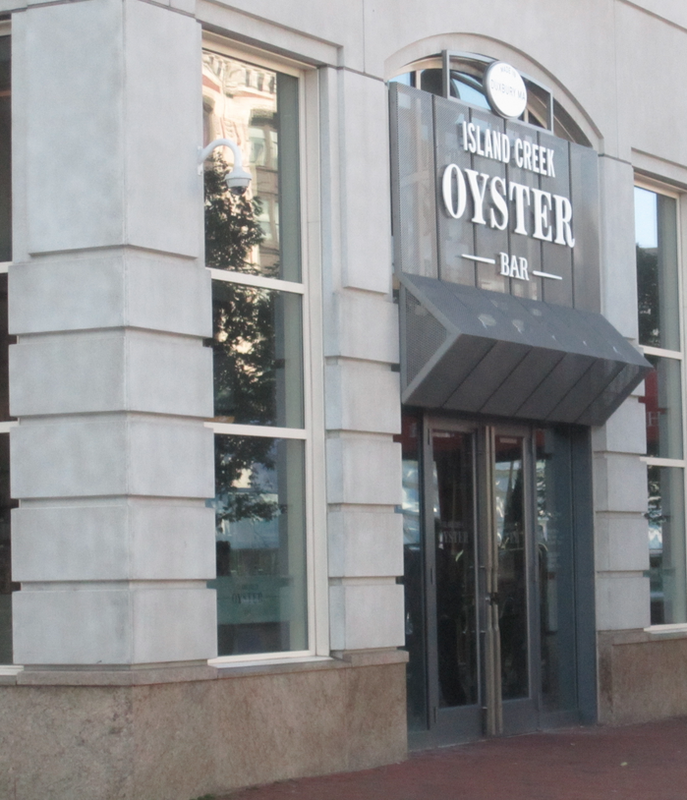 WEBSITE: http://www.lobstalandrestaurant.com/home.html. 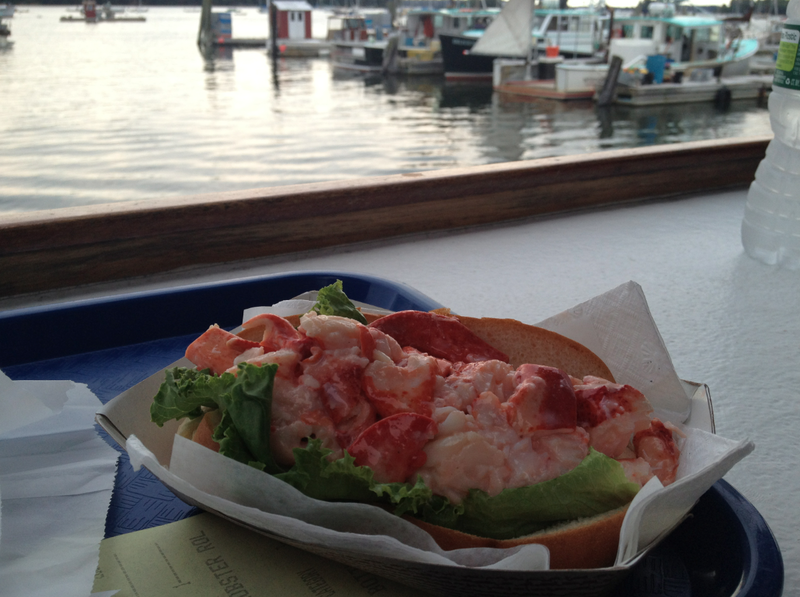 FACEBOOK: https://www.facebook.com/pages/Lobsta-Land-Restaurant/120860174608565?fref=ts. PHONE: 978.281.0415. 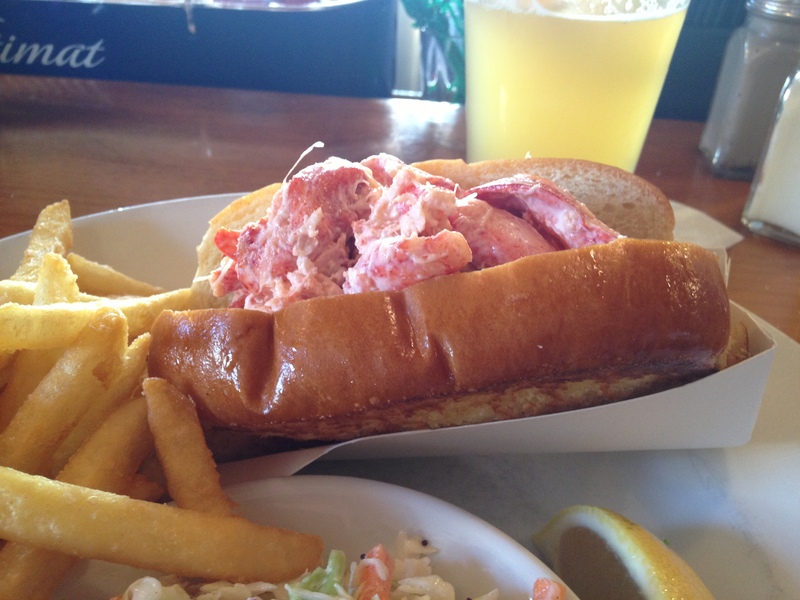 A really great, sweat roll rooted in lobster roll tradition. Really great!